After a summer spent learning about, reading about, and writing about it, I finally tonight sat down and watched My Little Pony: Friendship is Magic Equestria Girls. Given that I will be presenting on the topic of fractured fandom surrounding this movie’s marketing and release, I wanted to form my own opinion on the movie. To see how much what I was thinking about when I first heard about this movie was addressed or not in the movie. And perhaps to see where I came down on the different sides’ opinions about the movie. One thing that surprised me — yes, at one point, they actually did look like they do in this picture in the movie. It is during the climactic showdown. That is a head’s up: this article will be filled with spoilers. So if you do not want to have the movie and the experience watching it spoiled for you, read no further. Otherwise, click to read on. The movie occurs after Twilight Sparkle ascends to the position of princess at the end of the abridged third season. After proving her worth by figuring out a spell from Star Swill the Bearded, Twilight is made into an alicorn (pegasus + unicorn, what all princesses in Equestria are) and crowned princess. At the beginning of Equestria Girls, she, Spike, and their friends arrive at the Crystal Empire, which had been the focus of so much of the third season, for a royal summit between the four princesses. Twilight confides to Spike that she does not think she is ready to be a princess, to rule as the others do, as she is still have problems getting accustomed to her new wings. Luckily, a plot device happens that allows for her to go on a journey and gain this confidence. While she sleeps, a thief sneaks into Twilight’s room. Sunset Shimmer, a new character, attempts to make off with Twilight’s crown, which also happens to be Twilight’s Element of Harmony. However, a stumble over Spike’s tail awakens Twilight and leads to a chase through the castle with Twilight and her friends. When they seemingly corner her in a room, the plot device kicks in: there is a mirror in this room that connects to an alternate universe, and can only be used every 30 moons. Apparently, Sunset had been a student of Princess Celestia, but she had become jealous of Twilight and, naturally, turned evil. 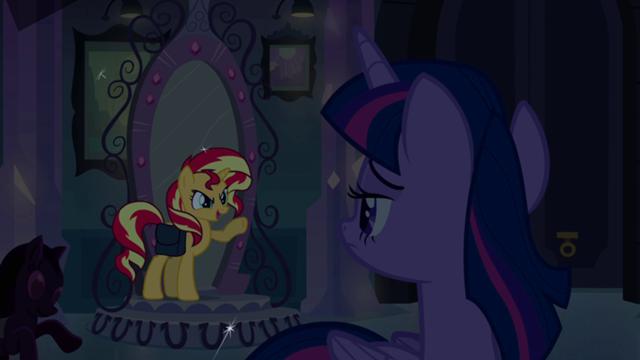 She had disappeared into this mirror 30 moons ago, and is back to steal Twilight’s Element of Harmony to give her great power in this alternate world. It is up to Twilight, and Twilight alone (although Spike tags along), to retrieve the element before Sunset can bring chaos to the alternate world, and before Twilight is stuck there for 30 moons. 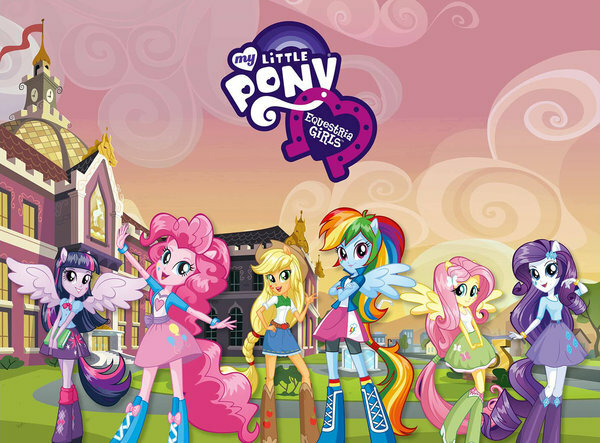 Equestria Girls was Hasbro’s attempt to take a television series and toy line intended for young girls and make it accessible to older girls — tweens and teenagers. Every aspect of the alternate world Twilight enters through the mirror seems to have been made through a collusion of the marketing and writing departments at Hasbro. What results is an Alice in Wonderland meets The Wizard of Oz meets Cinderella story that allows Twilight to explore the same coming-of-age as a young woman issues that those stories explored. All with references to modern life and pop culture that are assumed to have an appeal to an older audience. Once Twilight gets through the mirror, she finds herself in a different body — a human body, although it is never referred to as such in the movie. Spike has become a dog, to represent his subservience to Twilight. As Twilight learns more about this world, she finds and befriends the human analogs of her pony friends. Moving through Canterlot High, she mingles with other humans that are representatives of the ponies she knows — indeed, part of the fun of the film is playing the “it’s that pony!”game, where you match what pony the human form represents. All of the main Ponyville citizens and tourists are there, each bearing their cutie mark in some form on their clothing, as if the cutie mark is a pattern or logo on their clothes. Because we are to believe all of the humans are pony analogs, they are also all different colors, representing the range of colors the ponies are painted. Doing so allows the filmmakers to skirt the thorny issues of racial and ethnic diversity in the real human race, as well as providing possible free identifications for us real humans watching the film. Not breaking the humans into different races or ethnicities means that they could be anything — which ties into the series’ message that we can be anything, and that we are all more alike than different. Such is the moral lesson at the center of this moral play. The movie utilizes the situation of entering high school for the first time, and all the stereotyped concerns that come with it, to bring the series’ messages about friendship and equality and being yourself to the older demographic. The idea is that teenagers would understand the situation, and tweens would be looking forward to the experience, and thus both would be susceptible to this message. Making the connection to the high school experience begins in the first song of the movie, “This Strange World.” Twilight is ostensibly singing about being in this new human world, but the lyrics of the music align with entering high school as well. Twilight learns that in order to retrieve her crown, she has to win it during the Fall Formal, where she could be crowned Princess with her own crown. Unfortunately, Sunset Shimmer has spent her time in this world monopolizing the high school and winning the crown for the past three years. And Sunset will stop at nothing to make certain that Twilight does not win the popular vote of the students. She uses tactics akin to cyberbullying today to devalue and embarrass Twilight’s run for Princess. This storyline allows for the writers to reference modern life and pop culture, from YouTube to smartphones to coffee shops. All of which are direct references to things high schools are supposed to like. To counter Sunset’s nefarious schemes, Twilight has to call upon her pony friend / human analogs. But in order to be able to rely on them, she first has to restore their friendship with each other, which had apparently been rendered asunder due to Sunset’s machinations. The main message from the series about the magic is friendship is embodied in this re-knitting of the group, and is repeatedly mentioned in song and in the climactic end battle, when the girls are able to embodied the Elements of Harmony despite not having them. Along with having to rekindle her pony/human’s friends friendship, she also has to desegregate the entire school in order to win their support to be Princess of the Fall Formal. Sunset had been hard a work separating people in the school until cliques formed and people did not cross clique-lines. The cliques match those of real high school — jocks, musicians, science nerds, eco-heads, etc. When Twilight first arrives, Sunset taunts her with “You don’t know the first thing about fitting in…” — meaning that Twilight does not know how to navigate these cliques and make friends. Along with being another direct analogy to the stereotyped experience of high school, it is another indication of what Twilight’s goal will be in order to win back the crown. Indeed, to promote Twilight’s run for this position, the girls devise a school song that highlights commonalities, coming together, and Twilight’s ability to unite people. This theme is repeated a little later in the film, when the girls have to repair the damages done to dance decorations in the gym in time for the fall formal — and in time for Twilight to be crowned before the portal back to Equestria is closed for the next 30 moons. At this point, seeing all of the friends working so hard together, other students join in, crossing those clique-lines to make certain that the dance occurs on time. With that success, Twilight wins the popular vote, and wins back her crown. But Sunset does not leave this be, and through a struggle recovers her stolen loot. With the Element of Harmony, she is able to gain tremendous power and transform into a demon. But her power is not enough, as Twilight and her friends are able to draw upon her Element to apparently awaken the latent powers in her friends and reestablish the magic from their powers combined — enough to undo Sunset’s powers and teach her the ultimate lesson: that the magic of friendship is the only magic that can truly unite people. The day is saved with the realization about the importance of friendship and uniting across differences, and Twilight learns to become comfortable as a princess who’s real power is in inspiring people to stand with her rather than bow before her. Overall, the message of the movie aligns with the message of the series, with no more or less saccharine or obviousness than what is seen in the series. The animation is on the same level, impressing me with the transformation sequence Sunset undergoes when she gains the powers. I even like the character designs, in how they brought in the pony elements to the human versions. But they do clearly bring in pony elements that explicitly create the anthropomorphized ponies. In one scene, seen in a video above, Rarity gets the idea for how to promote Twilight, and it involves wearing a headband with ears and an attachable tail — all meant to represent the school’s mascot, the Wonder Colts. Later, during the climactic battle, the girls gain some of their pony attributes when the are empowered by Twilight’s Element of Harmony: wings are returned, human ears become horse ears, and hair gets lengthened and changed to resemble manes and tails. Part of this seems to about representing that the magic of friendship is not confined to Equestria. Another part of it seems to be about accepting and being happy with who you are, as the other students do not seem fazed by what the girls have become, and indeed Twilight’s would-be suitor, Flash Sentry, joins in on the pony-dance she does. But it is still about marketing new toys, and there is still the odd sensation for me watching these characters and thinking about what type of depictions fans will produce, through clopfic and fanart. Each version of Sunset — pony, human, demon — can be found sexualized online. Hopefully the younger audiences watching the film — those for whom the film was intended — are not aware of such depictions. But at my age, with my experiences, it is hard to not have such an intertextual reading. In the end, the movie is not the best story to be associated with My Little Pony: Friendship is Magic. It closely aligns with the morality of those stories, but it seems more simplistic, even if it has more time to tell its story. There are plotholes galore — if all the other ponies have analogs in this world, why doesn’t Twilight— why does no one question if Twilight is actually a student — why would it be Canterlot High when the mirror was in the Crystal Empire — why does only Twilight seem to undergo the stereotyped romantic crush — why does Sunset have to fix the damage she causes — why does the Element of Harmony do what again? The answer to all of these questions appears to be “because” — the same type of answer given to a two year-old to stop the constant questioning. Glossing over these plotholes simplifies the story to focus on the morality. Which is fine — for a younger audience. But an older audience — even the targeted teenager audience — might find the story too simplistic and the morality too heavy-handed. And no amount of modern dance moves and musical numbers to reference Glee can completely distract from these problems. If you are a fan of the series’ humor and focus on friendship, then there is nothing really offensive in this movie to turn you off. If you are not already a fan, then I doubt this movie would do much to make you one. Better to watch the series first and fall in love with that — then this film will not feel so odd.